All homes currently listed for sale in the zip code 92614 as of 04/25/2019 are shown below. You can change the search criteria at any time by pressing the 'Change Search' button below. "ONE OF THE LARGEST HOMES IN WOODBRIDGE WITH $700,000 IN UPGRADES AND VIEWS OF THE SOUTH LAKE! Welcome to 21 Emerald, on the market for the first time ever, this bright and traditional home has been extensively remodeled. Featuring a main level, en suite bedroom, hardwood floors throughout, custom woodwork moulding on doors and windows, and a dreamy chef's kitchen with Sub-Zero and Bosch appliances, double ovens and dishwashers, a large Marble island to entertain in! The formal living room and dining room offer soaring ceilings and plenty of sunlight. Upstairs has an added wing to the home with vaulted ceilings, a huge loft/flex room, movie theater with drop down projector and black out curtains all controlled by a smart tablet. Escape to the library room with a stone fireplace, shiplap ceilings and built in bookshelves. Enter double doors to the spacious master bedroom retreat with vaulted ceilings and include large, cedar lined walk-in closets, dual vanity, and soaking tub. Entertain in the low maintenance yard with jacuzzi, built-in BBQ and walking distance to the South Lake. No mello-roos, low HOA fees, and access to Woodbridge pools, tennis courts and lagoons, this executive home has it all!" "BEAUTIFUL APPOINTED AND WELL MAINTAINED HOME IN THE HEART OF WOODBRIDGE. 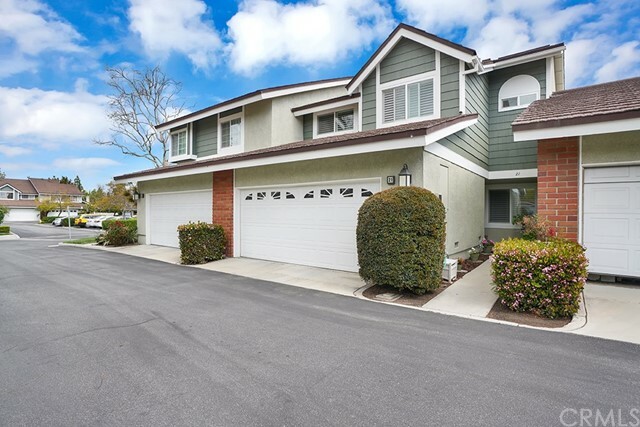 CLOSE PROXIMITY TO SOUTH LAKE, SCHOOL, SHOPPING, AND FREEWAY ACCESS. PREMIUM LARGE LOT FOR THIS COMMUNITY. PREVIOUS ADDITION ADDED 1100 SQUARE FEET TO THIS PLAN 4 HOME. NO BEDROOMS DOWNSTAIRS / ALL BEDROOMS UPSTAIRS; TWO CAR GARAGE. QUIET STREET IN A GORGEOUS NEIGHBORHOOD!" "Contemporary Living in a Garden Oasis. Rare, impressive, hidden gem Woodbridge Lakeshore home. Best of California indoor outdoor living. Nestled on extraordinary large & private garden lot, steps to South Lake Lagoon. Entertainers delight features expansive windows, ceilings, skylights, large light-filled rooms that flow into one another, as well as lagoon and mountain views. Large Chef s kitchen with center island, double ovens, warming drawer, granite countertop and backsplash, built in refrigerator, custom cabinetry and pantry is the center of this home. Designed for entertaining, generously sized dining & living rooms overlook the garden. Spacious First Floor Master Retreat overlooks the lush garden. Resort-Inspired master bath stunning Bisazza Italian Tile wet room, deep soak AIR tub, also vanity, dual sinks, and walk in cedar-lined closet. Warm and welcoming family room overlooks the lagoon & leads to three large upstairs bedrooms, bath & laundry room. Executive home has it all, over $250,000 in upgrades. 30 fully paid Solar Panels currently offsets electrical bill to less than $20 per month. Upgrades include tankless water heater, dual pane European style windows, new furnace, surround sound in master retreat & family room. Exquisite backyard featured in multiple garden shows with cascading pond, fruit orchard, garden shed with living roof, Built-in BBQ, spacious hardscape & extensive landscaping. No mello-roos, low HOA, Access all Woodbridge amenities and schools." "Stunning LAKEFRONT property with panoramic views!!! Premier Location on South Lake Lagoon! Contemporary tasteful design, features include upgraded eat-in kitchen with custom cabinetry and counter tops, stainless steel appliances including smart built-in refrigerator, hard-wood floors, large bathroom with separate tub & shower, customized walk-in closet, electronic blinds....total over $200,000 in upgrades... Additional delight features include ceilings, skylights, plus retreat area for master bedroom and fireplace in living room. Beautiful lake view from dinning room, kitchen, living room and master bedroom suite....Direct lake views from balconies and front door....Community offers Pool, Spa, Fire Pit, Barbecue, Outdoor Cooking Area, Picnic Area, Playground, Tennis, Sport Court, Biking Trails, Club House and parks. Award winning schools..."
"Wonderful 5 Bedroom 4 bathroom home in very desirable West Park area, Huge bonus room with attached bath used as 5th bedroom to give this home 3 master suites and 2 additional bedrooms with a jack-and-jill bathroom. Nicely appointed kitchen with granite counters, maple cabinets, white appliances, recessed lights and breakfast nook. One bedroom suite downstairs, living room with fireplace and vaulted ceilings. Fantastic open floor plan with room for entertaining, professionally landscaped wrap around backyard with built in bar and room for BBQ. Close to shopping, parks, children play area and schools. Two car garage with lots of built-in storage space. HOA offers wonderfully landscaped tranquil parks, Olympic size pool & spa, tennis courts. Walking distance to schools, parks, shopping, restaurants and movie theaters. South Coast Plaza & Irvine Spectrum shopping, award winning Irvine schools and University of Calif Irvine campus only minutes away. Easy access to the 405, 55 and 5 Freeways. Low HOA dues." "Magnificently remodeled home in 2018. Owner spent well over $100,000 last year in interior and exterior w/new porcelain tiles, recessed lighting throughout the house, gourmet remodeled kitchen with quartz counter tops and white cabinets decorated w/beautiful high back splash throughout the kitchen, new Stainless Steel appliances, reverse osmosis water filtration and dispenser. New plush carpet in bedrooms and stairs, new bathtubs, shower heads, faucets and drains. All Windows and Doors replaced a few years ago with Dual Pane Glass. New water softener system. Newer Central Cooling and Heating, Water Heater. Spacious open space kitchen and family room w/stone fireplace & New Dual Pane Glass Sliding Door leads you to the Extra Large backyard for entertaining. Practice Golf w/Fun putting green. Cute paved patio w/brick, pergola, surrounded by low maintenance water savings professionally designed landscape. Attend Award winning Irvine Schools. Enjoy the community amenities w nearby tennis courts, pools/spas play ground and parks. Conveniently located to the shopping center, restaurants, movie theaters. Close proximity to S. Coast Plaza, Fashion Island, Segerstrom Performing Arts Center, University of California Irvine, John Wayne Airport. Wireless Camera Security System allows watching and monitoring online, anywhere in the world. Additionally with One Ring answer the door and check-in on home at anytime from anywhere." 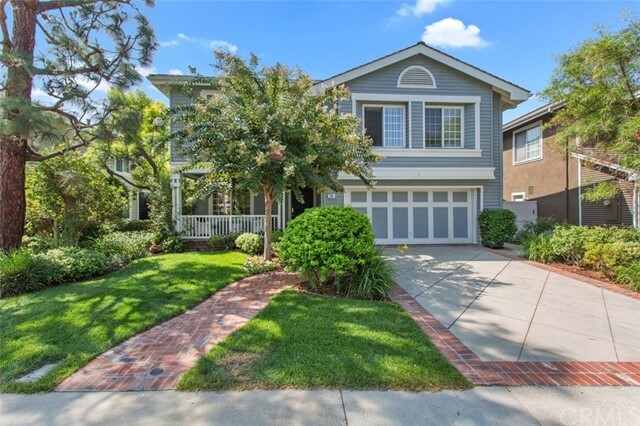 "You ll love this gorgeous turnkey home located in the high demanded Westpark community. 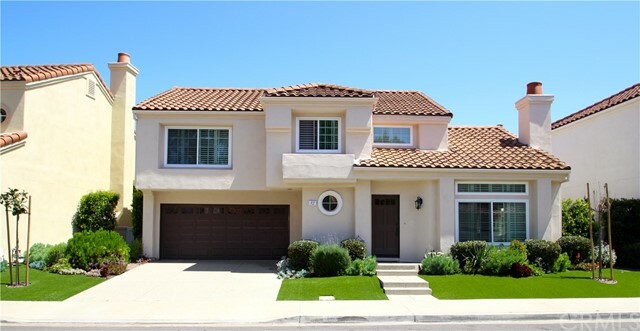 This beautiful two-story home offers 4 bedrooms, 2.5 bathrooms, and large lot 5,200sq.ft. LOW HOA of $88 month NO MELLO ROOS. Double front door entry with formal entrance leads into a spacious living room with fireplace, fresh natural paint color, crown moldings, and sliding door that open to a beautiful landscaped backyard. Lower level is graced with beautiful wood flooring thought-out the living room, family room, and dinning room Beautiful wood kitchen cabinetry with granite counter tops, ceiling lights, pantry and Stainless steel appliances (new gas range and dishwasher.) With a garden window looking out to a landscaped yard with covered patio. All rooms upstairs with ceiling fans has an abundance of natural light. The carpeted upper level has generous linen storage. The spacious master bedroom includes two closets, vault ceilings and granite counter top. Additional Features: Fresh paint inside the home, new screen windows, sliding doors and water softener connection. Association amenities include swimming pool, spa, basketball, tennis, volleyball courts, picnic area, playground and clubhouse. 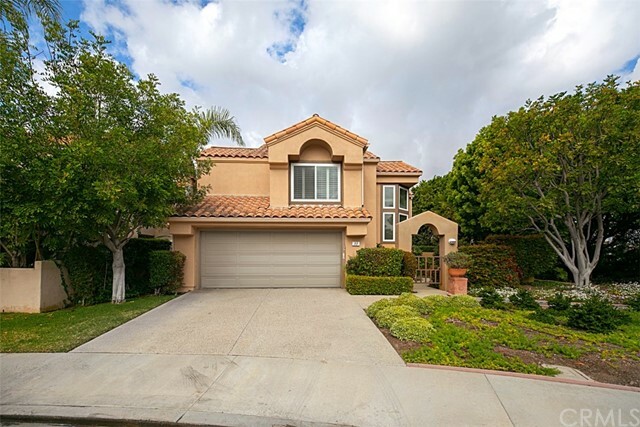 Excellent Award-winning Unified Irvine School District, close to dinning, shopping centers, Orange County Airport, UCI and freeways." " Westpark Tierra- Plan Two-Reflection Built by William Lyon 3 BR, 2.5 BA, Approx. 1,784 SF Living Space In a 4,400 SF Lot Front Courtyard Patio & Covered Porch w/a Double-door Entry Vaulting Ceiling & Large Center Fireplace in Formal Living Room Adjacent Formal Dining Room Has Sliding Doors & Chandelier Family Room w/French Door Access to Rear Patio/Lawn Areas Upgraded Kitchen w/Granite Counter Tops & White Glass Cabinetry Bay-Windowed Breakfast Nook w/Ceiling Fan & Light Fixture Upgraded Vinyl Windows/Doors & 2 Blinds in Several Areas Unique Upstairs Walkway Connects Master & Two Secondary Bedrooms Upgraded Bathroom Granite Counters w/Matching Sinks & Faucets Fresh Interior & Exterior Painting Including Roll-up Garage Door Great Potential For Extra Living Space And/or Room Additions Quiet Inside Tract Location With Nice Curb Appearance Low HOA Dues & Easy Access To All Community Amenities Walking Distance To Shopping Centers & Elementary Schools Shows Light & Bright! A-Must-See!!" "Everything about this home will excite your senses in every way! The location is just about the best you can hope for, being next to a small open space, and on the curve of the street. No homes behind, and only one next door! Lush landscaping includes lots of hardy fruit-bearing trees, stone pavers, and private open space. FULL DRIVEWAY and large lot! Walking up to the front gate, you enter into a beautiful GATED PRIVATE COURT-YARD, filled with lush landscaping and a water feature. Enter into a 2-story living room, with glass walls, plantation shutters, and French doors opening to the beautiful wrap-around yard and covered patio. Rich, dark premium hardwood flooring runs throughout the 1st floor, and brand new high end carpeting up the steps and upstairs. New windows, and new air-conditioning system has been installed. Master bedroom has huge built-in wall unit for additional storage, and 2 other large closets. The 3rd bedroom also has a built in desk/office area. The 2nd bedroom is quite large and also has a built in closet. The generous kitchen with dark, high end granite counters, full backsplash, pantry, and white shutter style cabinets and all new bathroom and kitchen fixtures. and valves. Wonderful bright homey house will make you so happy! Easy to rent to! Tons of storage! Community has pool, spa, sports court, and tennis courts! Homes of this caliber come along rarely, so don't waste a second! Last comp with no upgrades/ smaller yard $939K"
"Barcelona Model B- Catalan in a quite inside tract location with a wrap around yard. High vaulted ceiling, premium tile flooring, plantation shutters and newer double pane windows and doors. New exterior painting with excellent curb appeal with front turf landscape. New High Efficiency Air conditioning and Heating system, newer bath room fixtures/lighting and inside laundry. Master bedroom suite with walk-in closet, double sink vanity, tub & shower. Covered patio with built-in BBQ, Vinyl fence and side patio adjacent to the dining area. Two car garage with Full size drive way, walk to Westpark Elementary School, association pools, parks, and Harvard business complex. Must see." "Brand NEW energy-efficient townhome ready June 2019! Natural light pours into every room of this home through oversized Low-E windows of this beautiful Residence 3 plan. Four bedrooms and a perfect size chef s kitchen that spills onto a private deck for cooking or just hanging out. 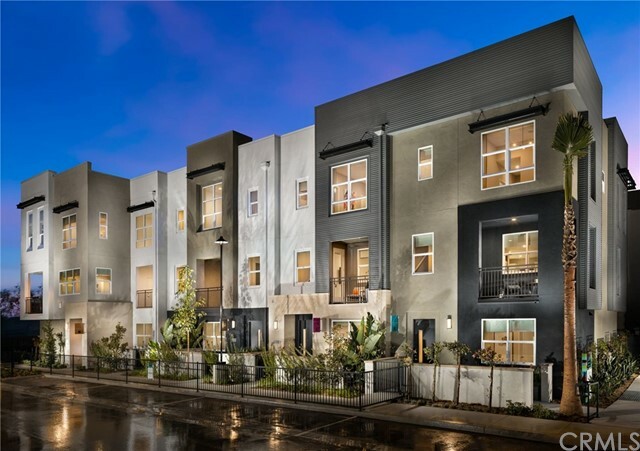 CitySquare is California s only all-electric Zero Net Energy attached community of a more comfortable, healthier home that promotes the apex of homebuilding. Known for their energy-efficient features, our homes help you live a healthier and quieter lifestyle while saving you thousands of dollars on utility bills." "NEW PHASE RELEASE FOR FALL MOVE IN! 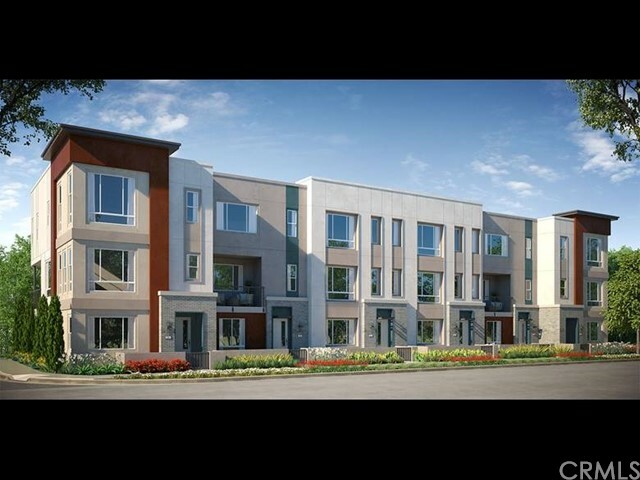 C2E... Close to Everything...Contemporary town homes in the heart of Irvine! Can you smell the fresh paint? Featuring state of the art new construction this plan offers an entry level EN-SUITE BEDROOM, 2 upstairs en-suite bedrooms and an amazing great room! Modern design with an huge kitchen complete with large island, white shaker cabinets with soft close drawers, Bosch stainless steel appliances, Moen 1800 series Stainless Steel Kitchen sink and Moen Chrome Faucet plus your choice of gray or white Quartz counter tops, just to name a few of the included features. Off the great room is a generous sized private deck to complete the modern, contemporary design with tons of light, skylights and 9 foot or higher ceilings, direct access two bay garage. Price includes buyer's choice of standard flooring and upgraded can lights in great room and bedrooms. Energy Efficient construction PLUS low HOA and LOW base tax rate, with NO MELLO ROOS, property has an additional L&L tax of approximately $115 per year Private pool and park with tot lot all with payments close to area rents! Community is part of the Tustin School District. All within walking distance to Diamond Jamboree and just a short Uber away from the heart of OC, SCP and UCI. Lock and leave lifestyle is just minutes to John Wayne Airport, The District and Park Place. Pictures are artist rendering or of model- actual home is under construction." "Brand NEW energy-efficient townhome ready June 2019! Residence 2 offers covered outdoor spaces that invite you and friends to step out and take in Orange County skylines and enjoy the peace and quiet of the cozy living room courtesy of standard spray foam insulated exterior walls. CitySquare is California s only all-electric Zero Net Energy attached community of a more comfortable, healthier home that promotes the apex of homebuilding. Known for their energy-efficient features, our homes help you live a healthier and quieter lifestyle while saving you thousands of dollars on utility bills." "This MUST SEE enchanting single level detached home that was remodeled 6 years ago is the home you have been looking for! Low HOA of $75 month-NO Mello Roos. Corner lot with plenty of street parking. The home is surrounded by roses, 12 types of fruit trees & bamboo shoots. Double front door entry with formal entrance leads into a spacious living room with vaulted ceilings, fireplace, skylight for natural lighting & sliding door that opens to a beautiful landscaped backyard sanctuary, with fountains & BBQ gas line, perfect to relax and entertain. Beautiful wood kitchen cabinetry with granite counter tops, custom back splash, Stainless steel GE appliances & a slider to the side yard. Granite center island with extra storage. Kitchen opens to the dining area with built in cabinetry & an open space to the living room. The 3 bedrooms all feature Brazilian laminate wood flooring and the rest of the house is tile. The front bedrooms both have triple glazed windows. Epoxy floors in the garage plus built in storage cabinets and a pantry. Central air conditioning and heat. Smooth ceilings with recessed lighting. Community amenities include a newly remodeled club house, huge Olympic swimming pool, spa, children's pool, basketball, tennis & volleyball courts, picnic area & playground. 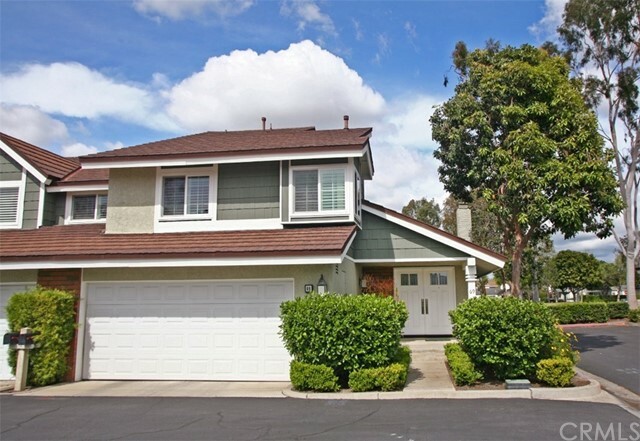 Located in the desirable Irvine Unified School District, & in the prestigious University High School attendance zone. Close to Orange County Airport, freeways, restaurants, libraries, entertainment & more!" 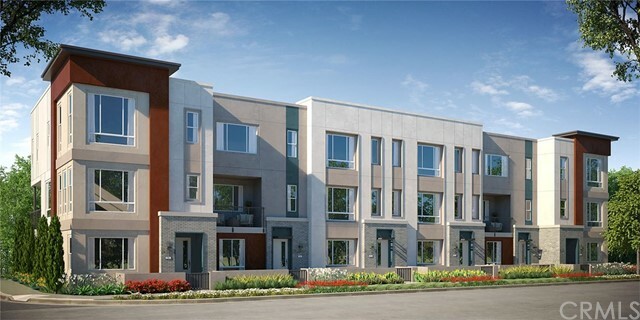 "Brand NEW energy-efficient townhome ready June 2019! Spread out, there is a spot for everything and everyone in this Residence 1, modern open floor plan. Sleek, all-electric appliances including refrigerator, washer and dryer use less energy all thanks to integrated energy efficient features. CitySquare is California s only all-electric Zero Net Energy attached community of a more comfortable, healthier home that promotes the apex of homebuilding. Known for their energy-efficient features, our homes help you live a healthier and quieter lifestyle while saving you thousands of dollars on utility bills." "Lowest priced 4-bedroom home in Woodbridge. 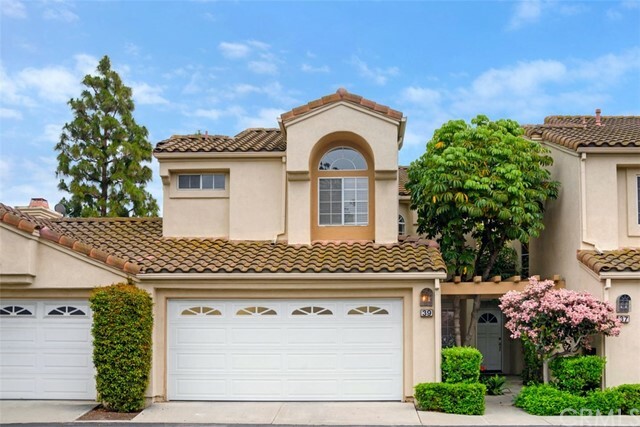 This immaculate turnkey Woodbridge townhome, the largest model in the tract, an end-unit location near park, pool and school! Fresh neutral paint, recessed lighting, newer dual-paned windows/doors and new window coverings/blinds throughout complement the bright and open floorplan. Enter double doors to the inviting living room featuring soaring ceilings, rich distressed wood floors, 2 light-catching skylights and cozy gas fireplace. 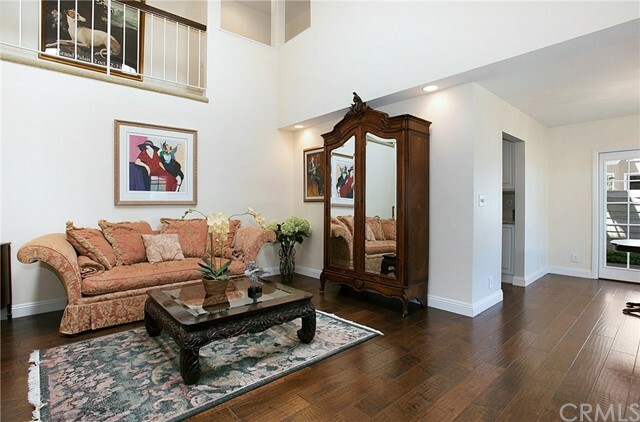 The living room seamlessly flows to the formal dining room w/ French doors to the backyard. The kitchen has been remodeled w/ fresh white cabinets w/ unique functional features, granite counters and stainless steel appliances. The kitchen opens to the family room featuring French doors to the backyard. A full bathroom with granite-topped vanity and luxurious walk-in shower and a full-size laundry closet complete the downstairs. Upstairs, the master bedroom boasts vaulted ceilings, walk-in closet and an en-suite master bathroom w/ dual sinks, soaking/Jacuzzi tub and a walk-in shower. Three additional bedrooms are generously sized and share the full hall bathroom. The convenient 2-car attached garage features an extended driveway for added parking. Enjoy the resort-like amenities of Woodbridge Village which features 22 pools, splash pad, 16 spas, 2 beach lagoons (w/ boat docks), premiere tennis program and much more! Walking distance to award-winning Meadow Park Elementary & South Lake Middle School." 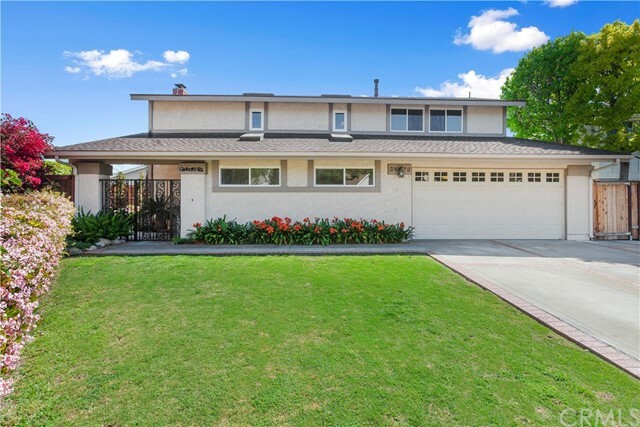 "Beautifully updated Woodbridge home within walking distance to Blue Lake Pool and Park. Warm wood floors welcome you into this 3 bedroom 2.5 bath home. Family room welcomes you with cozy modern brick faced fireplace and white mantel, open to the kitchen and dining nook. Light and bright upgraded kitchen with white cabinets, gorgeous granite stone, clean matching appliances all with a view of your garden and a pass through window for easy BBQ fun in the afternoons. Formal dining room and kitchen nook make dining for small parties or large Holiday's possible. Gracious Master Suite upgraded with Plantation Shutters and vaulted ceilings making it open and relaxing. Master Bath has been highly upgraded with quartz stone, dual sinks, new brushed silver hardware, new white shaker cabinets, modern shower door that opens out for easy entrance, new porcelain tiled shower with intricate marble inlay and beautiful tile floors. Two Secondary bedrooms are ample in size and accented with white Plantation Shutters. Secondary bathroom has been meticulously upgraded and accented with a Quartz counter, Stone tiled walk-in shower and new tile floor. The patio lends itself to gardening, play time, kid or dog play area. Two car attached garage completes this wonderful home. Amenities include two lakes, two beach sand lagoons, 20+ pools, 16 spas, tennis courts, parks, volleyball courts, a big wheel park, and horseshoe facilities. Award-winning Irvine School District all within walking distance." "Park view from this beautifully maintained home which backs to Daybreak Park. Relaxation beckons from almost every window. Imagine enjoying your favorite beverage on the patio or from the interior, viewing out. Close enough to view, far enough away for privacy. Gracious living from the double door entry to the drought resistant landscaped patio which has a gate for park access. Outstanding floor plan features a cathedral ceiling, fireplace & windows on 3 sides. Expansive counter space in the kitchen will please every cook, refrigerator included. Stand at the kitchen sink & watch the park activity. Stove replaced 2018, disposal 2017 & dishwasher 2013. Windows replaced, scraped ceilings, recessed lighting & panel doors. Ceiling fans in all bedrooms. Master bath vanity plumbed for 2nd sink. Walk-in shower. Furnace, AC & water heater replaced 11/2018. Inside laundry, washer & dryer included. Direct garage access & don't miss the storage cabinets & shelves in the garage. Centrally located in Woodbridge, inside the loop & near Smokestone Park & the South Lake Beach Club. Enjoy the Woodbridge lifestyle! Also close to shopping, restaurants and entertainment - including the Great Park & the Spectrum. Centrally located between the 5 & 405 freeways. 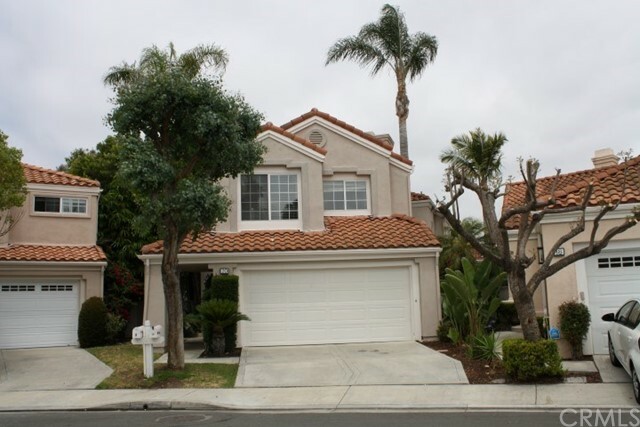 Add the award winning Irvine schools & low property taxes, this home has it all!" 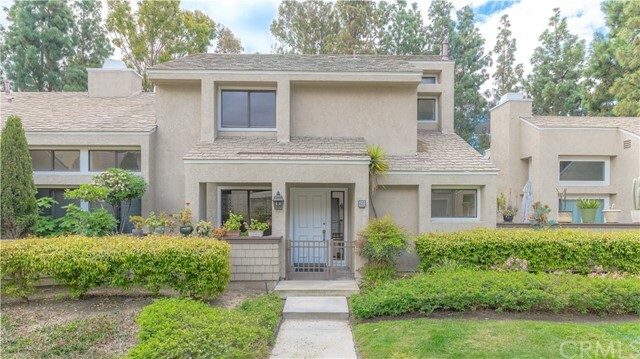 "Nestled in the tree lined streets of the Woodbridge area of Irvine, this two story condo in Woodbridge Chateaux is a peaceful green sanctuary. This 3-bed 2-1/2 bath condo has vaulted ceilings, skylights, a private, enclosed patio and petite front courtyard. The warm wood laminate floors throughout really make this a comfy retreat. The entry hall leads to bath, laundry room and spacious office/den and leads to the bright, open living room with vaulted ceilings, fireplace and sliding glass doors and private, enclosed patio. The spacious dining room is adjacent to the kitchen and can accommodate dinners with the entire family. The kitchen has travertine tile counter-tops, electric range/oven, microwave, and dishwasher. There is also enough room for breakfast nook seating in the kitchen. The kitchen also has a side door that leads to the patio, making it easy for the outdoor chef to fire up a great dinner al fresco. There are two master bedrooms, the smaller of the two has an en suite with shower in tub with glass doors and single sink with resin counter-top. The larger master bedroom has two large closets and the en suite has dual sinks, shower in tub and skylight. The unit has a detached two car garage and is near local parks and schools. The community amenities include pool, barbecue, playground, clubhouse, tennis courts and includes trash fees. Nearby you will find lots of dining, shopping and award winning Irvine schools." 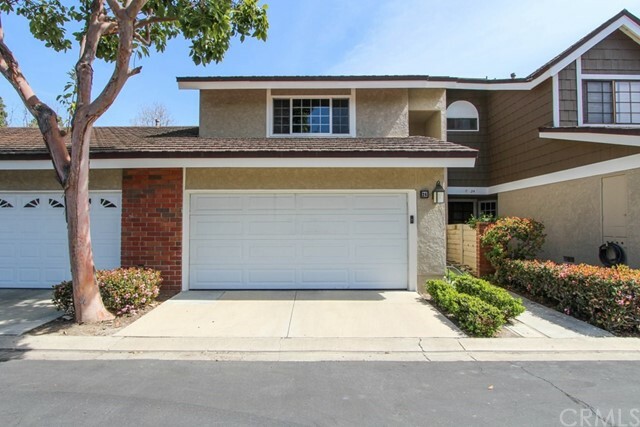 "Snuggled inside the prestigious Woodbridge loop surrounded by parks, lakes, and excellent schools, this charming, single-story end-unit home offers Irvine living at its best. A large front lawn beckons you inside the freshly painted front door, where you are treated to a newly refurbished kitchen, eating area, and cozy living room, complete with big windows, comfortable fireplace, and a warm stone hearth. New recessed ceiling lights and new light fixtures shine a bright, modern touch throughout this home, complementing the real hardwood floors, new baseboards, and fresh paint and carpet. Both completely remodeled baths feature beautiful marble tile floors, modern tile showers, and elegant vanities. Off of the kitchen, entertain and dine al fresco in a generous private courtyard and patio boasting a gorgeous fountain, mature avocado and citrus trees, and storage room. A two-car carport is only a few steps from the patio gate for direct access to the kitchen. The well-planned Woodbridge community features easy walking and bike access to Irvine schools, convenient shopping, dining, and medical centers, The Woodbridge Theatre, and numerous resort-style recreational amenities centered around its two lakes and lagoons, all with no Mello-Roos! 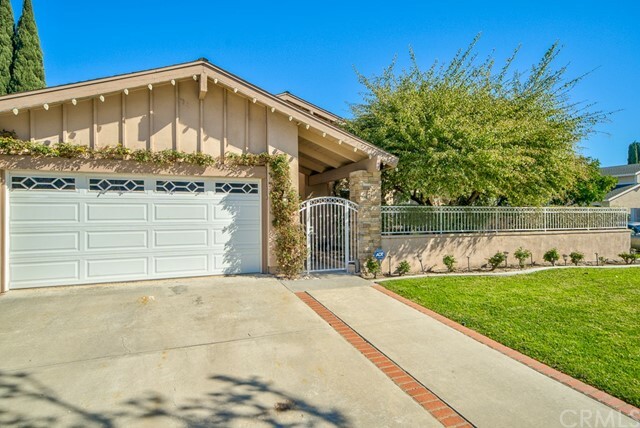 Close proximity to tennis, golf courses, world class beaches, and John Wayne airport. 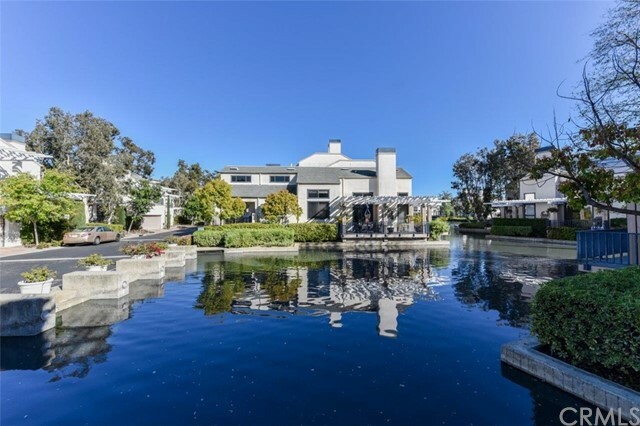 Hurry home to this jewel in the heart of Irvine!" 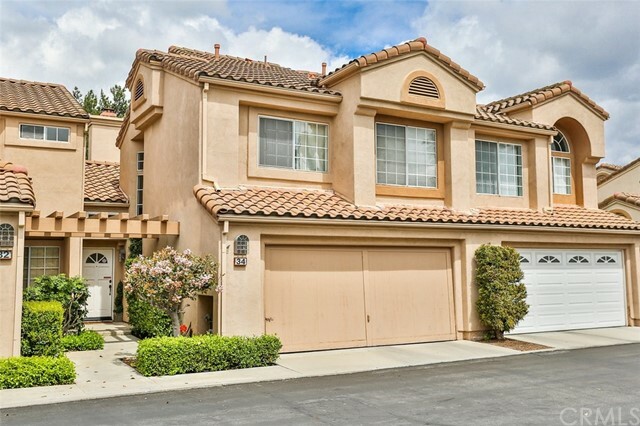 "Rarely available and highly sought after Del Sol model townhome in the Las Palmas Community in Westpark. 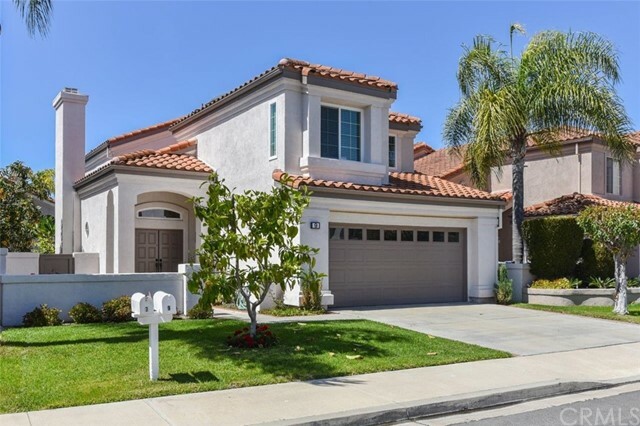 Close to absolutely everything Irvine has to offer: shopping, restaurants, business centers, the 5, 405 and 55 freeways, SNA Airport, OC Beaches and best of all award winning Irvine schools including University High School and UCI! This 3 bedroom, 2 1/2 bath home with inside laundry, direct access garage, upgraded kitchen with beautiful granite counters, slate back splash, double hammered copper sink and stainless appliances, custom tile floors downstairs, en-suite master with huge skylight and one of the largest backyards in the entire community. Vaulted ceilings for architectural accent, cozy fireplace, mirrored wardrobes and a brand new state of the art Forced Air Heating system just added. Homes in Las Palmas seldom become available, don't miss your opportunity." "Located in Woodbridge, one of Irvine's most sought-after neighborhoods, this 3 bedroom 2 bathroom home is move-in ready with many upgrades done just one year ago including: light wood laminate flooring in most of the home, interior paint throughout, carpeted stairs, stove, hood range, master bedroom vanity, and quiet garage door opener. There are also dual pane windows with plantation shutters throughout the home. The kitchen features Corian counters with tile flooring in both the kitchen and dining room. The sliding door in the dining room opens to the backyard patio that is perfect for entertaining. Upstairs, there are 3 bedrooms, including the master bedroom which features high ceilings, en-suite full bath, and walk-in closet. Lastly, you will love that this home is walking distance to exceptional schools, pools, parks, and South Lake." "Highly sought after Plan 1 at C2E for May Move in! C2E means you are Close to Everything come find out why we are 70% sold out! This plan offers a corner location in a town home design with great cross light, 3 story, sleek and modern design with direct access two car garage side by side. New construction centrally located in Uptown Irvine with state of the art features in the huge kitchen with walk out private deck off kitchen, white shaker cabinets with soft close drawers, Bosch stainless steel appliances, Moen 1800 series Steel Kitchen sink and Moen Chrome Faucet PLUS your choice of gray or white Quartz counter tops, just to name a few of the included features. Upstairs offers two spacious bedrooms both with direct access bathrooms, one with a walk-in tile shower. This plan features skylight on third floor and 9 foot or higher ceilings and Energy Efficient construction. ASK US ABOUT OUR FAST MOVE IN SPECIAL AND FREE WASHER & DRYER! C2E offers low HOA and LOW base tax rate, with NO MELLO ROOS, property has L&L tax of approximately $115 per year. Private pool and park with tot lot all with payments close to area rents! Community is assigned to the Tustin School district and all within walking distance to Diamond Jamboree. Lock and leave lifestyle is just minutes to John Wayne Airport, The District, Park Place and South Coast Plaza. Pictures are artist rendering or of model- actual home is under construction. Bring your picky buyers!" 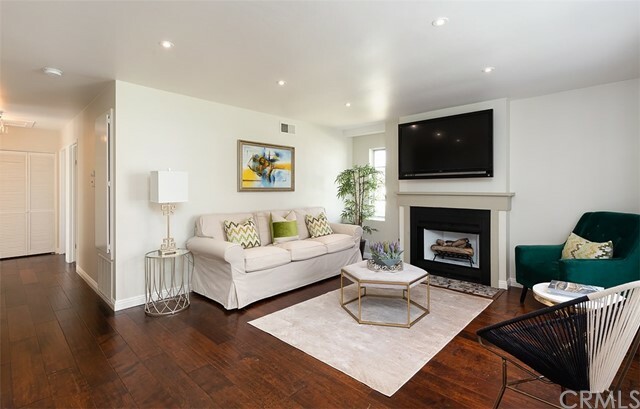 "Stylish and contemporary townhome in the Westpark community of Las Palmas is light and bright with vaulted ceilings, an open floor plan and TWO MASTER SUITES. Wide 7 plank Du Chateau Antique White Oak hardwood flooring in the lower level leads to a contemporary updated kitchen and remodeled half bath. Kitchen has Walnut Travertine floors, GE Profile stainless appliances, designer Sektion cabinetry and quartz countertops. An updated half bath downstairs has a stylish vanity and a glass subway tiled wall with lighted mirror. 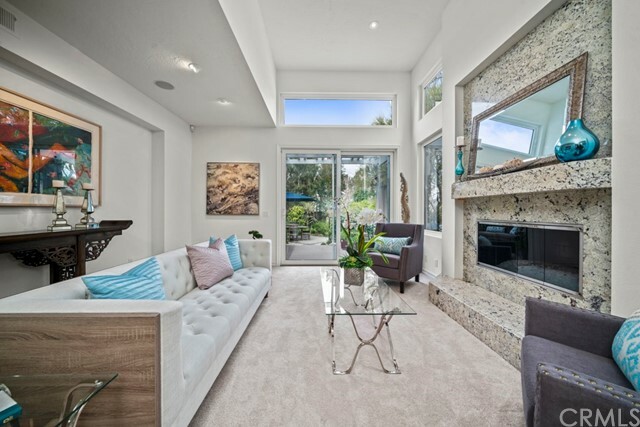 Living room with soaring ceilings includes a gas fireplace and sliders that lead to a private enclosed patio. Home enjoys one of the most private locations in Las Palmas with no units behind it and no traffic. Spacious dual masters upstairs with private full baths make this a perfect primary residence or a great investment property. Both baths have been remodeled with contemporary floating vanities with quartz countertops, wall tiles, and subway tile accents. Laundry is upstairs for your convenience. Home has central heating and air conditioning and a large attached 2 car garage with epoxy flooring. Conveniently located near shopping and restaurants, its central Irvine location is close to both the 405 and 5 freeways for easy commutes. Award winning Irvine schools include Culverdale/Westpark Elementary, South Lake Middle School and University High School."